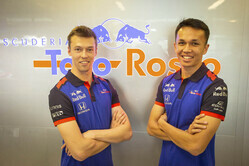 As the Toro Rosso STR is unveiled, drivers Daniil Kvyat and Alexander Albon talk of their hopes for the coming season. When you left Formula 1 and Toro Rosso in 2017, did you think that you'd be back one day? 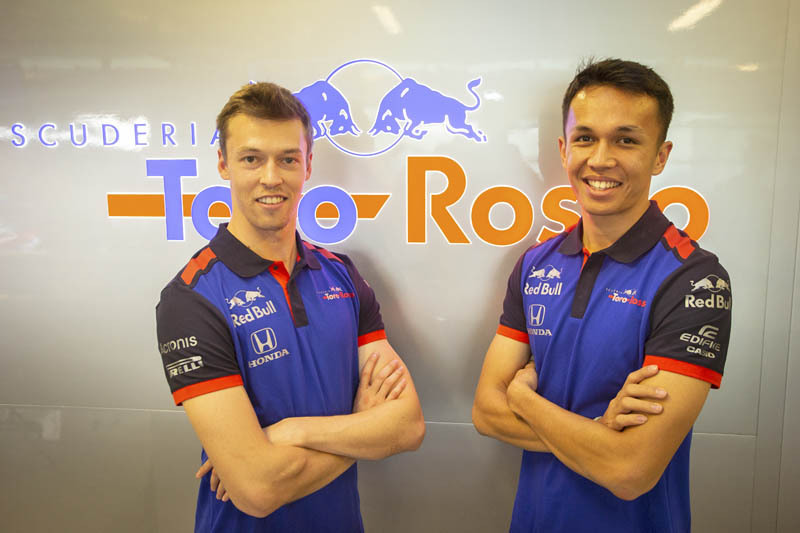 Daniil Kvyat: Let's just say it's great to be back and it proves you should never give up hope. Last year, I enjoyed my time working with Ferrari, which helped me keep in good shape and in touch with what is going on in Formula 1 on the technical front. When was the last time you actually raced? DK: It was the 2017 USA Grand Prix, although, apart from all the simulator work last year, I have done a lot of karting which always keeps you sharp. Do you feel you have changed and matured since 2017? DK: I don't want to say whether I've changed or not. I know there's been a lot of speculation about this and whether I've matured or not and so on, but I prefer to let my driving on the track answer. I just want to get in the car and see what happens. There is plenty of work to do and four days on track in Barcelona before we go racing, which will be very important for everyone. Do you think your development role has helped you to become a better driver? DK: I really appreciate the opportunity that Ferrari gave me last year. It was a great experience and I gave it everything I had. I really enjoyed working for them. They were very kind to me, so I repaid them by always working hard and never said no to extra days work. It was a pleasure. To be honest, I think even if you only drive in the simulator, nowadays they are very sophisticated, so you can practice and practice and I think by driving a lot there, it's kept me in shape and allowed me not to forget how an F1 car feels. You drove our car in the end-of-season test in Abu Dhabi, how did that feel? DK: I'd say that after about five laps, everything felt completely normal to me. It was a very good feeling, almost as though it was one of my first ever F1 tests. It was a very happy few days for me leading up to it and a cool experience. I drove 155 laps with no problems. I think now, every time I go on the track it will feel like that, so it's quite nice. Apart from the fact you were working with Honda for the first time, when you did the test, could you actually feel much of a change in the cars since you were last racing? DK: My last race was 2017, then I was back a year after, pretty much. Yes, there has been an evolution from the car that I last drove for Toro Rosso, but things haven't changed dramatically so I was able to pick it up, not exactly from where I left off, but I was still pretty much in the loop with everything. You've been to the factory in Faenza and you've seen a few new faces but also some familiar ones. How do you think the team has evolved since you were last there? DK: Honestly, there are more familiar faces than unfamiliar ones. Obviously, the biggest change has been the engine supplier now that we have Honda. Regarding the engineering side, everything is relatively the same compared to when I left. The engineering group around the team is very similar. Have you got any particular expectations or goals for 2019? DK: We don't know exactly where we're going to be. Like everyone else, we are working hard to put the best package together and the best thing I can do for myself is to work as hard as possible on myself and on my performance. I believe in the guys in the team. They know what they're doing. Me and my engineering crew will do everything we can to squeeze the maximum out of the package we're given by the team. I think we're looking good and I feel that everyone is motivated and focused. I can see that and it gives me confidence for the future. Do you expect to be the natural team leader, given that your team-mate is a complete rookie? DK: I'll just go out, do my job, drive the car as fast as I can and give my feedback and then we can decide together which direction to take. It's team work! You're still the only Russian on the grid so I guess Sochi will be a highlight. What are you particularly looking forward to this year? DK: If I had to wait until Sochi to have a highlight, that would be a long wait! I think I will enjoy every race this year. You take it event by event. Of course Sochi is always very enjoyable, but so too are Australia, Bahrain and China because they are the first three races. I'm really looking forward to the season kicking off. Let's take it step by step. The Barcelona test is first then Australia, then we go race by race. We'll take it that way, I think that's the wisest plan. It's going to be an interesting season, because there are several new youngsters like your teammate and you're not the only one coming back, Robert Kubica is as well. Looking at it from the outside, do you think it's going to be a vintage season? DK: Yes, I think so. I think there's always interesting aspects to every season in Formula 1. This year, there's quite a reshuffle in terms of drivers and there's a few new regulations coming in. Robert is a very interesting comeback. I've known him since I was quite young and racing against him is something I am looking forward to. He was the guy who first brought me to an F1 paddock in 2009. I was karting and he had a karting team, I won a race and I got a ticket to watch F1 testing in Barcelona. I saw Robert there and he said, "Oh, it's you!" and then he gave me a tour of the BMW garage. He showed me the steering wheel, the car, the engineers' room, everything. That was a cool memory. Regarding the rest, hopefully the battles will be close on track and the gaps between the teams will not be too big, that will be a great incentive for good racing. What are your first impressions of Honda? DK: I've been following how they are getting on quite closely. What I do know is they're definitely very motivated. They're pushing like hell and working really hard to achieve the best engine possible and that's exactly what the team needs. As long as we work as one mechanism, push each other and always aim as high as possible, that will help. There are many things to take on-board for a rookie in Formula 1 because there is so much different technology to anything you've been used to before. How are you facing the start of the season at the moment? Alex Albon: Obviously, I think it's going to be a steep learning curve. I'll get four days of testing in Barcelona before Melbourne so we don't have a lot of driving. The main focus is to be comfortable in the car and get up to speed as quickly as possible. We'll see. In terms of my personal preparation, I'll try not to put too much pressure on myself and give it everything I have from day one. It's my opportunity this year to show everyone what I've got. You've spent a lot of time in the simulator, presumably to get up to speed with the circuits? What's going to be the biggest change from F2 to F1? Getting used to the hybrid Power Unit? AA: Yes, I'd say so. I was fortunate to do some Formula E testing, so when I did that I learned a lot about the powertrain and it's quite surprising how similar the two are. I wouldn't say the technology is the same, but the way you have to save energy and things like that, they're very similar. It was useful to have done that testing, I think it won't be too difficult to adapt to that. The main thing really is just the pure speed of the car. Obviously, these cars are quicker than ever now, even if speeds might drop a little this year. But in terms of the jump from Formula 2 to Formula 1, it's really, really big. That's mainly from the downforce. I think the speed won't be too difficult to deal with, it's more just the pure width of the car I'll have to get used to. Secondly, something which I think people don't realise, is just the sheer amount of people and the work ethic involved in F1. It's different in the sense that you have so many people working for you and they're all striving to be as quick as possible, so for a driver there's a lot of interaction with the team. There's always someone that I need to speak with in order to get the maximum out of the car. In Formula 2, I had two engineers, there was a head engineer and I had two mechanics in total. So that's six or seven people and now I'm going to a team that's got almost 400 people. It's a different ball game but I'm getting used to it - It's a nice problem to have! On to more personal matters, why have you chosen 23 as your race number? So you've gone for a half-Rossi?